What can I say? The writer, John Broome, had me back at “deepest Africa”. The story starts with Grodd’s escape from his cell in Gorilla City and oddly presages the first Grodd story I actually did read wherein he attains a human form (bald human form, natch) following his escape. This story would have blown me away just as much had it actually been my first. Infantino’s art is beginning to round into fine Flash form at this point and both stories in the book are beginning to take on the stylish and handsome look that would be the hallmark of his initial run on this book. The battle with the Flash in Grodd’s lab is a twelve year old’s dream come true. Once again I’m baffled that this story didn’t make the cover. Nevertheless, it’s apparent that John Broome was having fun writing one of the Flash’s strangest and most powerful foes… not to mention visually interesting. 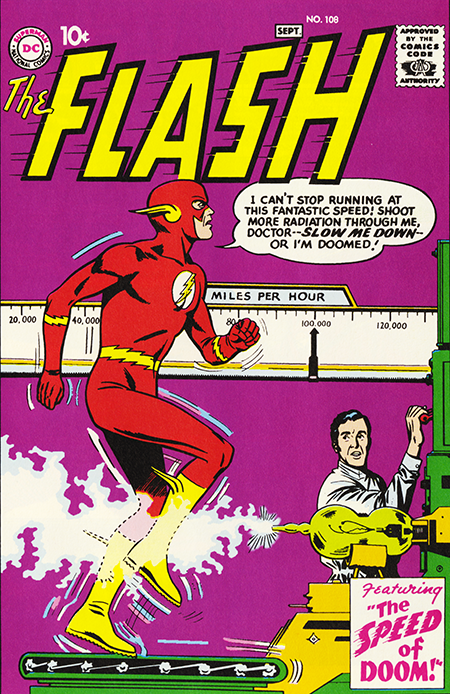 The cover story “The Speed of Doom” is notable mainly for the fact that it visually foreshadows the cosmic treadmill that Flash will eventually use to travel back and forth in time. Other than that, it’s a fairly routine parallel dimension story where the aliens are bald and whose dimension the Flash is able to zip in and out of with skepticism inducing ease. The saving grace is the beautiful Infantino/Giacoia art which is a pleasure to look at. And, as with most Julie Schwartz edited books, there was a scientific fact to be learned. The story taught me what a fulgurite was. Your homework assignment before the next Flash Friday will be to look that up and learn what it is for yourself.